© 2001 Artists Rights Society (ARS), New York/VG Bild-Kunst, Bonn. Photograph by R.H. Hensleigh. By 1930 Arp turned to creating sculpture and found himself aligned with the practitioners of the Surrealist movement in Paris who explored chance, abstraction and the creative unconscious. Arp executed freestanding sculptures in terra-cotta, marble and bronze, and insisted that rather than “abstractions,” his sculptures were “concretions” or generations of a natural form, a distinction that emphasized the additive (rather than reductive) manner in which Arp initially modeled his sculptural forms in clay or plaster. Arp’s visual vocabulary during this fertile period is expressed in works that evoke torsos, birds, plants and other elementary organic, human and animal-like forms. The stunning polished bronze Arp sculpture in the Shuey Collection is from the last decade of the artist’s career, executed shortly after an important retrospective of his work was presented by the Museum of Modern Art in 1958. Seuil aux creneaux végétaux exemplifies Arp’s innovations in sculpture and harkens back to his early experiments with torn paper collages and woodcut relief. 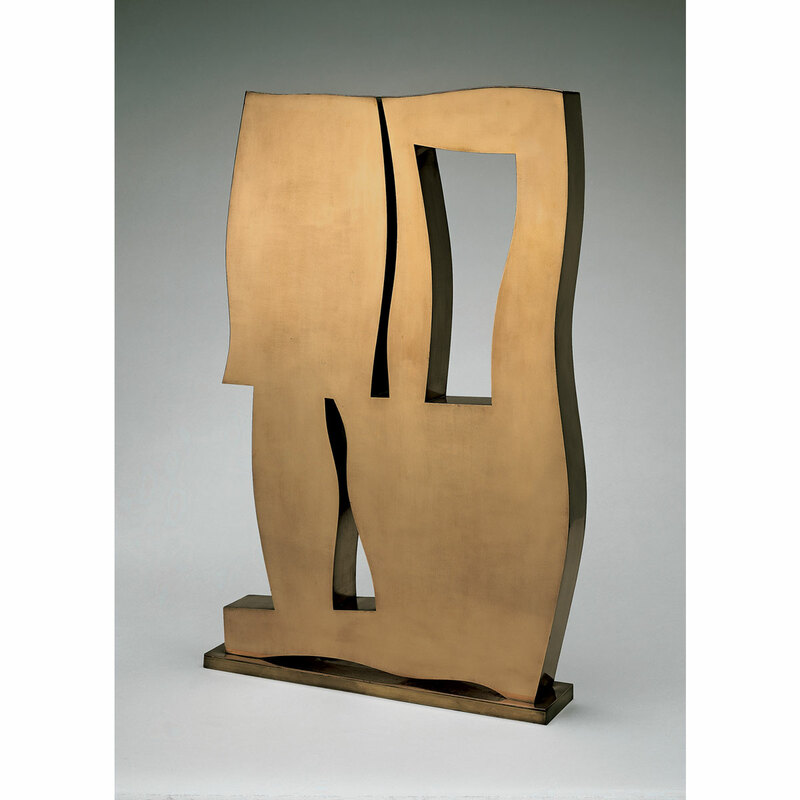 Standing two and a half feet high from its base, this work gives three­ dimensional form to Arp’s influential two-dimensional works and embodies many components of his unique visual language. An assertive, upright form, Seuil aux creneaux végétaux reads as a detached relief, liberated from its two­ dimensional plane. Punctuated by areas of cut out shapes, Seuil aux creneaux végétaux‘s poetry of solids and voids create ambiguous elementary forms that read as both organic and geometric. The work’s enigmatic title—which translates as Threshold with Plant Crenellations—further points to Arp’s interest in giving form to elemental visions of life itself. Part of a series of similarly titled sculptures, Arp viewed these works and the perforations in their forms as organic passages to new vistas not of this world.